Long-term studies that follow the trajectory of Zika-affected infants and children will close important knowledge gaps and help us meet the diverse medical needs of the children as they age. Winter is a time when many people in the United States, particularly those in northern areas, are not thinking about mosquitoes and the diseases they can transmit. To the south, however, in Florida, Texas, Puerto Rico, and parts of Latin America, thousands of couples, pregnant women, families, and travelers continue to deal with the threat of Zika virus, a mosquito-borne and sexually transmitted infection that can lead to an array of birth defects and life-long developmental problems. For more than a year, the National Institutes of Health (NIH) has accelerated research to better understand Zika, to develop a safe and effective vaccine, and to improve diagnostic methods, among other goals. At NIH's Eunice Kennedy Shriver National Institute of Child Health and Human Development (NICHD), our focus has been on the virus's impact on pregnancy and child development. As we mark National Birth Defects Prevention Month, we call attention to the ongoing needs of Zika-affected families and for the enhancement and expansion of research efforts to monitor the virus's effects on early childhood into young adulthood. Zika's link to microcephaly, a condition in which babies are born with very small heads and possible neurological damage, has captured international attention. While we in the research community have discovered much about the virus, perhaps one of the more important conclusions we can draw so far is that microcephaly is only one of the many severe complications of Zika exposure in the womb. Children born to Zika-infected mothers can face many other health problems. While some conditions, such as growth restriction and arthrogryposis (joints that are permanently bent and do not straighten), are easily detectable via prenatal imaging or during postnatal exams, others, such as brain abnormalities and hearing and vision loss, can be subtle and require additional tests. Children who appear physically normal at birth can have developmental delays or even develop microcephaly later in infancy. These manifestations are collectively called congenital Zika syndrome. These and other outcomes of in utero Zika exposure were discussed at an NIH-sponsored workshop in September 2016. Clinicians from Zika-endemic areas discussed the medical and developmental problems they have seen firsthand, including severe muscle problems, recurrent seizures, and difficulty swallowing food. One speaker highlighted the abnormal reflexes she witnessed among affected children. She shared a video of one-month-old infants rolling over and sitting up--actions mistakenly interpreted by the families as accelerated development. Sadly, these abnormal reflexes raise concern for the children's future development. Our goal should be to conduct a full, long-term assessment of the exposed child, including monitoring for physical symptoms, as well as for signs of intellectual and developmental disabilities. What has been reported to date likely represents only the most severe cases. As we know from experiences with other congenital infections, such as cytomegalovirus, there probably are more subtle outcomes of which we are not yet aware. Careful monitoring and evaluation of behavior, developmental stages, and achievement of milestones will improve our understanding of the full impact of prenatal Zika exposure and help us to identify potential medical treatments and other interventions, such as physical therapy. Unless we take the time now to understand the full impact of this congenital infection, many children may not get the interventions they need in the near future. At NICHD, we focus on the entire life process rather than a specific disease or body system. Our advances in physical and intellectual developmental disabilities, rehabilitation, fertility, pregnancy, and childhood conditions can be applied to Zika-affected families. We urge researchers, especially those who do not study infectious diseases or pregnancy, to consider how their work can help. Collaboration across medical specialties will be vital. · Child development: All Zika-affected children, even those who do not show symptoms at birth, should be monitored during their early years to see if they reach typical developmental milestones or develop autism spectrum disorders. · Intellectual disabilities: Children with intellectual and developmental disabilities often benefit from speech and occupational therapy, and early educational intervention. These approaches may need to be tailored for children with congenital Zika syndrome. · Rehabilitation: Problems with muscles, joint, and mobility are well documented for Zika. Children may benefit from physical therapy and novel prosthetics, including exoskeletons that may help children achieve independent mobility. · Mental health: Maternal infections during pregnancy have been linked to future development of mental health conditions, such as schizophrenia, in adults who were exposed in the womb. Although there is no evidence that Zika infection results in schizophrenia or other mental disorders, children exposed to the virus should be evaluated into adulthood for signs of these conditions. 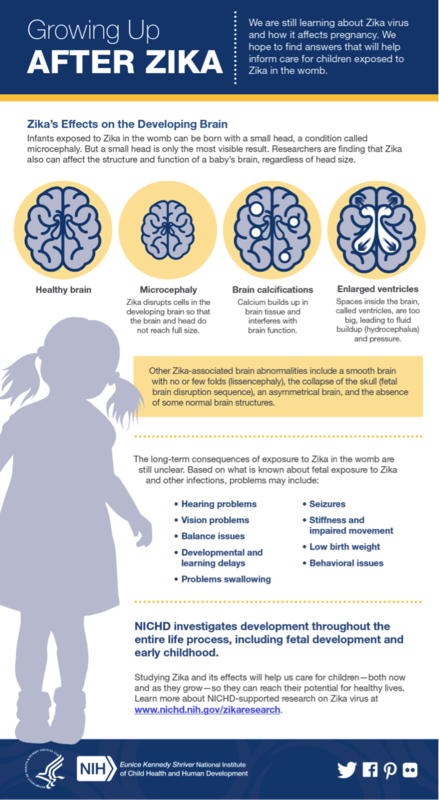 · Neurologic disorders: Because of Zika-related brain malformations, children are at life-long risk for seizure disorders and will require specialized care and treatment. Long-term studies that follow the trajectory of Zika-affected infants and children will close important knowledge gaps and help us meet the diverse medical needs of the children as they age. Though we have made much progress in understanding the virus, more research is urgently needed to fully grasp the long-term outcomes of Zika exposure. Development during the early years has a major impact on future health and wellbeing. In the time of Zika, we need the right tools to help give children the best possible chance. The long-term consequences of exposure to Zika in the womb are still unclear, but the virus can affect the structure and function of a fetus' developing brain. An infographic explaining these effects is available in English, Spanish, and Portuguese.